Today’s Lumiappaday is Splinter Cell, an Xbox Live title by Gameloft available for the Nokia Lumia 800. I’d suggest downloading the trial and giving it a go first to see if you like it. Note that the game is quite large so you will need WiFi to download it. Apologies in advance for the shoddy demo. Filmed in the early hours of the morning, my contact lenses were drying up due to the harshness of my lighting. I could not actually see the screen properly as the level I was on was naturally dark so I looked like a spaz making Sam walk into lamp posts and exposing him from the shadows as opposed to hiding and being stealthy. It turns out that it was more visible on camera than I thought (Watching in the viewfinder to see if I was in shot) so you can at least see what I’m doing. The controls are all touch, left thumb to move and right to shoot/hide/aim gun/look around. The rest of the extra game controls are explained during game play. The game is quite big so expect a few seconds to load levels – they’re long enough so you don’t come across this too often. If you do exit the app to do something else, you can just resume back in without reloading of the whole thing. It’s actually a really fun game that I urge you to at least try in the free trial mode. If you give it a go you can see what it’s like not playing at arms length and with excess lighting blinding you. It’s easier to see where Sam’s going, aiming his gun, taking head shots, sneaking around the shadows etc. Apparently in the first level, as you can see in the video, being stealthy is not at all necessary. Sam seems invincible (he can die, he just fell off a tower as I was trying to take photos) as he just runs towards the enemy to kill them on close contact. Again not what you’re supposed to do and you will be graded. I’ve not actually gone past this level, I thought I’d demo this whilst I can as the list of things to demo is too large. The game is a little on the expensive side at £3.99 though actually not much more than the Apple Store (where it has been for quite a while) so the game is holding its value. 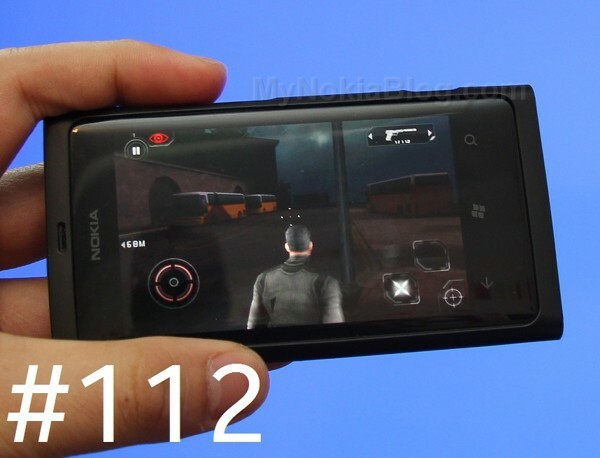 « Q1 2012 WP estimates; Nokia Astound back up T-Mobile’s top 10?